Generates star shaped rainbow colored glints at locations where the Source clip is brighter than the threshold, and combines the glints with the Back input clip. 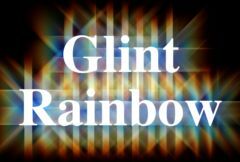 This is similar to GlintRainbow but here the glint source and background can be different clips. Front: The clip to use as foreground. Back: The clip to combine the glints with. Matte: Specifies the opacities of the Front clip. These values are scaled by the Source Opacity parameter before being used. Size: Default: 1, Range: 0 or greater, Shared . Scales the length of all glint rays. This and all the size parameters can be adjusted using the Size Widget. Note that a zero glint size still enhances the bright areas; set the brightness parameter to zero if you want to pass the Source through unchanged. Size X: Default: 1, Range: 0 or greater, Shared . Scales the length of the horizontal glint rays. Size Y: Default: 1, Range: 0 or greater, Shared . Scales the length of the vertical glint rays. Size Diag1: Default: 0.75, Range: 0 or greater, Shared . Scales the length of the diagonal rays from top right to bottom left. Size Diag2: Default: 0.75, Range: 0 or greater, Shared . Scales the length of the diagonal rays from top left to bottom right. Shift Blue: Default: 0.75, Range: 0 or greater. Shifts the blue component of the glints in or out relative to the red and green. This can be used with Shift Red to adjust the range of hues in the glints. Shift Red: Default: 1.5, Range: 0 or greater. Shifts the red component of the glints in or out relative to the blue. The green is centered between blue and red for a complete spectrum. Shift Out: Default: 0, Range: any. Shifts the glint rays outwards from their source highlights by this amount relative to the glint size. Blur Glint: Default: 0, Range: 0 or greater, Shared . The glints are blurred by this amount before being combined with the background. Hue Shift: Default: 0, Range: any, Shared . Shifts the hue of the glint, in revolutions from red to green to blue to red. Brightness: Default: 1, Range: 0 or greater, Shared . Scales the brightness of all the glints. Scale Colors: Default rgb: [1 1 1], Shared . Scales the color of the glints. The colors and brightnesses of the glints are also affected by the Source input. Threshold Add Color: Default rgb: [0 0 0], Shared . This can be used to raise the threshold on a specific color and thereby reduce the glints generated on areas of the source clip containing that color. Threshold: Default: 0.7, Range: 0 or greater, Shared . Glints are generated from locations in the source clip that are brighter than this value. A value of 0.9 causes glints at only the brightest spots. A value of 0 causes glints for every non-black area. Threshold Blur: Default: 0.1, Range: 0 or greater, Shared . Increase to smooth out the areas creating glints. This can be used to eliminate glints generated from small speckles or to simply soften the glints. Increasing this may put more highlights below the threshold and darken the resulting glints, but you can decrease the Threshold parameter to compensate. Source Opacity: Default: 1, Range: 0 or greater, Shared . Scales the opacity of the Source input when combined with the glints. This does not affect the generation of the glints themselves. Scales the brightness of the background. This parameter only has an effect if the background input is provided, and is visible due to a partially transparent Source image or a reduced Source Opacity parameter value. Brightness X: Default: 1, Range: 0 or greater, Shared . Scales the brightness of the horizontal glint rays. Brightness Y: Default: 1, Range: 0 or greater, Shared . Scales the brightness of the vertical glint rays. Brightness Diag1: Default: 1, Range: 0 or greater, Shared . Scales the brightness of the diagonal rays from top right to bottom left. Brightness Diag2: Default: 1, Range: 0 or greater, Shared . Scales the brightness of the diagonal rays from top left to bottom right. Glint Under Src: Default: 0, Range: 0 to 1, Shared . Set to 1 to composite the Source input over the glints. Glint From Matte: Default: 0, Range: 0 to 1, Shared . Set to 1 to generate glints from the alpha channel of the source input instead of the RGB channels. In this case the glints will not pick up color from the source and will typically be brighter. Values between 0 and 1 interpolate between using the RGB and the Alpha. Comp Premult: Check-box, Default: off, Shared . Enable this for a better composite if the Front pixel values have been pre-multiplied by the Matte pixel values. This is also known as an 'additive' composite.